This command produces an output file from a Mesh Object. Some of the standard graphics packages are supported including AVS, GMV and TECPLOT. See below for full list of file types that can be written. The list is in alphabetic order and describes each valid file_type with syntax and usage. The dump command is followed by a keyword for file type. Valid file type keywords are listed below and include: gmv, avs, avs2, chad, coord, datex, elem_adj_node, elem_adj_elem, fehm, geofest, geom, gmv, gocad, lagrit, recolor, stl, stor, tecplot, zone, zone_imt, and zone_outside. The file_type keyword is followed by a string to be used as whole or part of file name as described below. AVS (.inp or .avs), Exodus (.exo), GMV (.gmv), LaGriT (.lagrit or .lg), and GoCAD (.ts). Will write the AVS UCD (Unstructured Cell Data) file format. The keyword avs = avs2 with attribute values written as real or integer depending on type. avs1 = old avs with all attribute values written as real (larger file size). The four optional iopt_ values indicate which information to write or skip, default is everything on with iopt values = 1 1 1 1.
the first line will write node coordinates, element connectivity, and node and element attributes if they exist. The second line will write node coordinates and element connectivity, but not node attributes or element attributes. If iopt_ values = 2, or if iopt_points = 0, then the output will not be a valid AVS UCD format file. These options are provided to enable a user the flexiblity of writing ASCII files with desired information, and are not intended to be used with read/avs or other Applications that read AVS UCD files. A WARNING message is given for non-standard AVS output. The following describe valid iopt_ values. iopt_points is the first section listing node id and their x y z coordinates. = 0 Do not output node coordinate section. iopt_elements is the second section listing element id, material, type, node vertices. = 3 Output points as AVS pt type for VIS applications. This is only for nodes with 0 elements. iopt_node_attributes are the node attributes listing name, type, node_id and values for each. iopt_elem_attributes are the node attributes listing name, type, element_id and values for each. avs      =  All numbers written as reals. For a description of the AVS file format see the read/avs command. Will output a file nodes, faces, and connectivity for tet, hex, pyr, or pri in CHAD format. Writes attributes imt and itp. Will output a single file with node list x,y,z values and element connectivity list in FEHM format. Files are written in FEHM format and are described by clicking here for details. The coord file is one of a set of files written when the fehm file type is called. will output a file with Geometry, Element, Region, Location, and Dataset in DATEX format. Option: delatt - Write adjacency information to an ascii file. Write list of all elements adjacent to each element. Write a mesh object to a file in the Exodus II format. The keyword psets as token 5 will cause all psets (lists of vertex numbers) associated with the mesh object to be written to the ExodusII output file. The keyword eltsets as token 6 will cause all eltsets (lists of cell numbers) associated with the mesh object to be written to the ExodusII output file. If face set information is being provided from files (file1 file2 ... filen) the format of the file is written in AVS UCD cell attribute format. The first column is the global cell number, the second column is the local face number. Click here for more details on options and files that are written for ExodusII. Write out a series of files for the FEHM flow and transport code. The tokens after the cmo name are all optional. The following keyword commands are optional and can occur in any order after the cmo name. ascii or binary indicate IO Mode Options for the stor file. Default is ascii. scalar, vector, both, area_scalar, area_vector, or area_both are Area Coefficient Options for writing stor file coefficient values. Default is scalar. all, graph, coefs, or none are Compression Options for the stor file. Default is all. delatt or keepatt deletes or keeps CMO Attributes created to find outside zone nodes. Default is delatt. 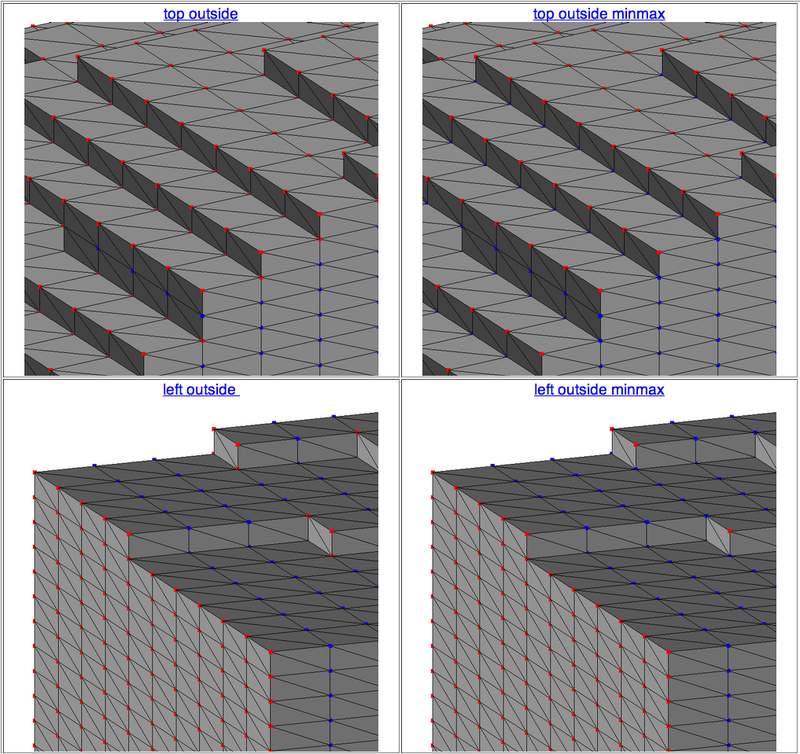 hybrid or nohybrid Specify whether hybrid median-Voronoi control volumes should be used. Default is nohybrid. The default options will delete the outside node attributes and will not add attributes for the outside voronoi or median areas. The stor file will be written in ASCII format with scalar coefficient values with compression of area coefficient list and indices. Click here for more details on the FEHM files and options. Click here for the FEHM style STOR file format. Write a file to be read by the GeoFEST, Geophysical Finite Element Simulation Tool hosted by Open Channel Foundation. The output file is ascii. Write a file to be read by the graphics program GMV. The defaults are binary and current mesh object. NOTE: For LaGriT versions dated after October 1999, use cmo/setatt//ipolydat/no to reduce file size. This command will keep the polygon data from being written to GMV files. Write a gocad TSURF file. Write a LaGriT restart file that contains geometry and mesh object information. The geometry belongs to the cmo_name with which it was created. The cmo_name can be -all- in which case all mesh objects are written to the file or it can specify a list of mesh objects to be written. A subsequent read/lagrit command will restart the code at the state at which the dump command was issued. The default file type is binary. Write coefficient matrix (stor) style values in PFLOTRAN .uge format file. The default dump/pflotran command does not write zero coupling coefficients. Use the keyword nofilter_zero to include zero coupling coefficients in the file. The following is the format used by PFLOTRAN for .uge (explicit unstructured grid) file. The first block are the list of ids of cells and the coordinates of cell centroids and the volumes of the cells. The PFLOTRAN cells are Voronoi volumes, one for each node. The second block consists of a list of ids of the connecting cells (id_up, id_dn), coordinates of the face centroid between the two connected cells and areas of the faces. Output in STL, stereo lithography format. This is only supported for triangle mesh objects. Same syntax as dump/fehm except the only output is the FEHM sparse matrix coefficient STOR file rootname.stor. File can be written in ascii or binary (fortran unformatted platform dependent). The area coefficient values can be written as scalar or vector. The compression default is all which will compress both the list of area coefficients and the indices. The coefs compression, or none compression both use and older algorithm and will result in larger files and may take longer to run. The stor file is one of a set of files written when the fehm file type is called. Click here for further explanation of syntax options. Click here for the FEHM style STOR file format. Write a file to be read by the Tecplot graphics package. The output file is ascii. Only node attributes are output, element attributes are ignored and not output. Tecplot does not support prism or pyramid element types so they are written as eight node, degenerate hex elements. The ioflag parameter is used to control if the node attributes are output or not is the AVS ioflag. The expected suffix for the file name is .plt. If a name is given without the .plt suffix, a suffix .plt is added. Output is ascii. This output format does not support output of a mesh with nodes but zero elements. If there are zero elements, a header is written but node coordinate information is not output. Write out a set of fehm format zone files for the mesh object nodes. These include zones for mesh materials and the external faces of the mesh as described below. The keepatt option will keep node attributes that tag nodes on external mesh boundaries (see zone_outside). The delatt option will delete the outside attributes if they exist (the are removed by default). The area attributes for outside nodes can be created with the keepatt_voronoi or keepatt_median options (see zone_outside). Files are written in FEHM format and are described in the dump/fehm command by clicking here for details. will output only one file with name file_name_material.zone. It is written in FEHM zone format and are described by clicking here for details. file_name_material.zone is node list for each integer material (imt) value. If the optional fifth argument is specified as an integer, then a node list file is written only listing the nodes with the value specified by imt_value. For options to output PSET’s as ZONE/ZONN files see PSET. The zone_imt file is one of a set of files written when the fehm file type is called. Write fehm zone format files that contain the outside node list and the associated outside area list. If keepatt is specified, then 6 node based attributes are added to the mesh object with the names top, bottom, left_w, right_e, back_n, and front_s. A node can occur in multiple zones. For instance, a node located on a top corner of the mesh can be found in zones for top, front_s, and left_w. file_name_outside_vor.area is a list of Voronoi area vectors (Ax_i,Ay_i,Az_i) associated with each external node. It is written to match the node lists as written in the outside.zone file. Along with each outside zone tag (such as top), there is a sum of each vector for that zone. For applications such as infiltration, the z component (each 3rd value) would be used from the top zone list. If the keyword keepatt_voronoi is specified, three node attributes (xn_varea, yn_varea, zn_varea) representing the voronoi area are added. If the keyword keepatt_median is specified, three node attributes (xn_marea, yn_marea, zn_marea) representing the median area are added and the file name will be file_name_outside_med.area. Note that the old version file name file_name_outside.area has area vectors computed with the median strategy. The option zone_outside_minmax is used to find the min and max external node along each row and column of a regular structured grid where the index for i, j, and k can be detirmined. The node attributes i_index, j_index, and k_index are created. Click here for an image showing difference between the default and the minmax options for outside nodes. These zone_outside files are part of a set of files written when the zone or fehm file type is called. The fehm zone format and descriptions are in the dump/fehm command details. Write generic exodus output without any sets. Write exodus output with point sets only. Write exodus output with element sets only. Write exodus output with face sets only. The facesets are internally calculated and defined. Note that the algorithm is computationally expensive and can take a long time to finish. Write exodus output with face sets only. The face sets are imported from file1, file2, …, filen. Write exodus output with all psets, element sets, and face sets. The face sets are imported from file1, file2, …, filen.